This product is a brand of pain medication otherwise known as co-codamol. Designed for use in cases of moderate pain, medication such as this is typically issued by doctors when they believe that lower strength treatments may not suffice. These instances of pain may be a headache, joint or back pain, toothache, or be related to an injury, or be the result of an operative procedure. As a form of co-codamol, the primary ingredients in this treatment are codeine and paracetamol. An everyday painkiller, paracetamol works by dulling the sensitivity of the nerves in the affected area. Codeine functions by releasing chemicals that help the brain to block out pain signals. So, although the cause of pain may still be present, the body and brain are less aware of it. Because this medication contains an opioid analgesic, it is essential to ensure it is suitable for you before you use it. 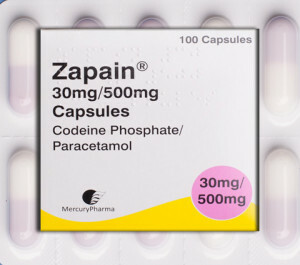 For this reason, you will need to undergo medical screening before you will be allowed to buy Zapain in the UK. A doctor may refuse to issue this treatment to persons who suffer from certain medical conditions and will not prescribe it to those who are allergic to any containing ingredients. Possible side effects include nausea, vomiting, constipation and addiction. For a more comprehensive list of restrictions, side effects and safety information, ensure you read the leaflet provided with the medicine. Our pharmacy will only ever use secure, unmarked packaging when shipping your item(s) to you. All orders are sent using next day tracked courier, so you can follow the progress of your order. If our pharmacy receives your order before 3pm on a weekday, they will ship on the same day. At all other times, your order will be delivered at the next available opportunity. When you buy painkillers online, you should always ensure you do so from a registered pharmacy. After placing your order with us, you will be guided through our secure consultation process. You will be asked to fill out a medical questionnaire, and a doctor will review your answers. If the doctor is satisfied that the treatment is safe for you to take, they will issue an electronic prescription and send it to our UK-based pharmacy on your behalf.